The word “Orthodontics” tends to conjure images of children with brace-filled smiles, but the reality is that nearly 20% of patients seeking correction of a crooked smile are adults. Many adults seek out orthodontic treatment for aesthetic reasons (a beautiful smile is, after all, a valuable career asset). However, healthy and well-aligned teeth have a profound impact on your oral and well-being. Malocclusion, the primary focus of Orthodontics, refers to an improper ‘bite’ or joining of the teeth. Having a severe overbite or underbite can lead to periodontal disease, tooth decay or TMJ (chronic jaw pain). Overcrowding, a lack of space for teeth to align normally, can also be detrimental to oral health and can even lead to difficulty chewing. Both malocclusion and overcrowding can be fixed by traditional metal braces, which require a course of treatment that can last years. ● Patients must avoid sticky or crunchy foods. 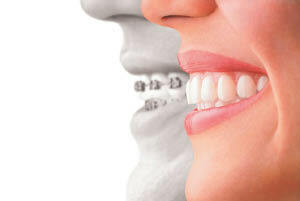 ● Metal braces require frequent dental visits for adjustments. ● Brushing and flossing teeth in braces are challenging. gear can get in the way. Patients considering orthodontic treatment turn frequently to removable devices like Invisalign®, which can accommodate a hectic lifestyle by making treatment flexible. Invisalign is an orthodontic treatment involving custom-made clear plastic aligners created for you and only you. The aligner trays are made of smooth, comfortable and virtually invisible plastic that you wear over your teeth. Wearing the aligners will gradually and gently shift your teeth into place, based on the exact movements we plan for you. You wear a new set of aligners approximately every two weeks, until your treatment is complete. Removable braces bypass the dietary difficulties of avoiding sticky or crunchy foods. Brushing, flossing and dental treatments are easy since you can remove the aligners. Clear or removable braces aren’t for everyone, and they do tend to be more expensive than traditional braces, but they’re becoming a commonly used option for adults that want a convenient method of getting a great smile. Please call our office at 212-481-2535 for an appointment to discuss Invisalign as a treatment option to straighten your smile. This entry was posted in Uncategorized by DG Admin. Bookmark the permalink.